Denny Hulme came from a most unusual background. As a child he lived on a tobacco farm owned by his grandparents at Moteuka on New Zealand's South Island. His father was a mystic, water diviner and fortune-teller who used these talents when serving with the ANZAC forces in the Battle of Crete in 1941. Convinced that he would not be killed, no matter what he did, Clive Hulme won the Victoria Cross with a startling career as a sharpshooter and came home a national hero. He then moved to Te Puke on North Island and started a trucking business. When Denny left school he went to work in his father's garage and saved up enough money to buy an MG TF which he began using in hillclimbs in 1956. Four years later he was chosen to be the New Zealand Driver to Europe and began competing in Formula Junior in Europe in a Cooper-BMC. In order to make ends meet he worked as a mechanic in Jack Brabham's garage in Chessington and gradually worked his way up the racing ladder. An early break was a factory Abarth drive at Le Mans in 1961 and then in 1962 Ken Tyrrell asked him to race in Formula Junior. That led to an invitation for "The Bear" - because of his brusque exterior - to become a Brabham works driver in Formula Junior. In 1963 he won half the Formula Junior races he entered and that resulted in an invitation from Jack Brabham to join the Brabham Formula 2 team in 1964. Brabham and Hulme won most of the races that year and finished 1-2 in the European Championship. Brabham gave Hulme the occasional runs in non-championship F1 events in 1964 but as he had Dan Gurney signed up and was racing the second car himself there was no room for Denny. Hulme made his World Championship debut at Monaco in 1965 and scored his first points later in the year in France. When the Formula 1 regulations changed in 1966 Gurney left the team to start his own operation and Hulme became the team's second driver in F1. The Repco engines proved to be very competitive and Brabham won the 1966 World Championship while Hulme finished fourth. The following year Hulme drove to the title with wins at Monaco and in Germany. Hulme also competed in CanAm with McLaren and took one of Gurney's Eagles to fourth in the Indianapolis 500. In 1968 Hulme moved to McLaren and raced in F1 and CanAm. He won the Italian and Canadian GPs, the non-championship International Trophy and took the CanAm title. In 1969 he won just one F1 race in Mexico and was runner-up to Bruce McLaren in CanAm. In 1970 he suffered serious burns to his hands at Indianapolis but played a major role in keeping the McLaren team together after Bruce McLaren was killed in a testing accident. Despite his injuries he won the CanAm title again and finished fourth in the World Championship. He continued to be a frontrunner in F1 and CanAm until 1973 when he retired following the death of his friend Peter Revson. 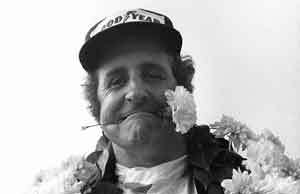 He led the Grand Prix Drivers Association's campaign for better safety standards for a while before retiring to New Zealand but returned to racing in the 1980s notably as a member of Tom Walkinshaw's Austin Rover team in the European Touring Car Championship. In 1992 he suffered a fatal heart attack while at the wheel of a BMW M3 during the Bathurst 1000 in Australia.